Outside of a Blog: Rolled storage: hanging file? The wrapping paper, above, was hung with those little hanging clips attached to binder rings. I decided to use binder clips and binder rings, as I have a plethora of binder clips in various sizes, and they clip easily onto thicker rolls. To solve the problem of knowing what is on the roll, I made some tags to hang on the binder rings. I just punched some circles from a manila folder (I like the plain look.) and punched holes in the circles. To make sure I would be able to read the tags, I flipped the "arms" of the binder clip up and clipped it on the "front" of the roll. Then I threaded the binder ring through the front arm of the clip, then the tag. I clipped the binder ring onto my wire shelving. Now I can remove a roll by un-clipping it and the label stays there as a place marker. One reason I had so many rolls is that I had some duplicates. Now that I can see what I have, I won't waste time and money buying supplies I already have! 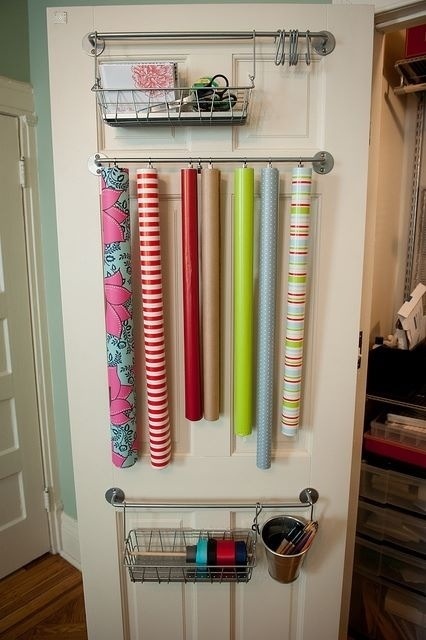 Do you have a great organizing tip that you recently put into practice?